Have questions? We'll be glad to answer them! E-mail us at: geeksnextstore AT gmail DOT com Shirts are done by the amazing Brunetto Tees! NOW AVAILABLE IN ALL SIZES! Real men are not afraid to share their love of ponies! Show the world that you aren't afraid to hoof it in this fun and colorful design. 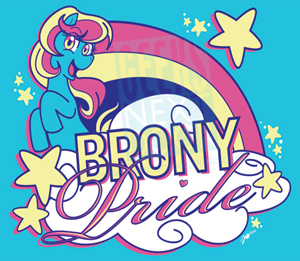 Fillies (lady fans) are also welcome to wear this shirt, but it only comes in brony sizes! Available on 100% Cotton Gildan in Sky. 100 full-color pages of our first year of comics, filled with commentary by Matt and Jessi, a special introduction by two special ladies, and a look at the comics before GND! 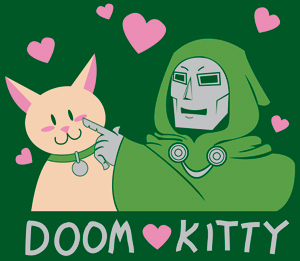 Even megalomaniacal villains need love - love from kittens. Lovingly created from an original sketch by Jessi (and Matt's idea). Available on 100% Cotton Gildan in Forest Green. Barry attends ConventionCon to meet his internet girlfriend. Too bad he was banned from the con the previous year! Will Barry be able to win the heart of the girl of his dreams? 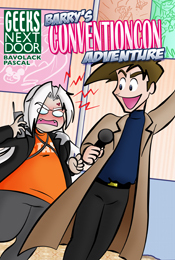 Or will he fail miserably and get caught by convention staff? 44 full-color pages of romance, adventure, and convention-y awesomeness! Based on the waiter's shirt from this comic. Show your support for good food, good times, and good-looking guys! Available on 100% Cotton Gildan in Tangerine. 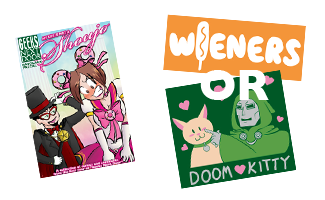 Doom Wieners Brony I dunno - you pick! 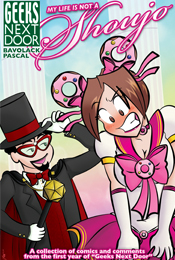 All comics and characters © 2007-2012 Jessi Bavolack and Matt Pascal. Site is best viewed using the mighty power of Firefox.